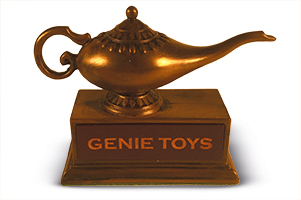 "Genie represents the best of the toy inventing community. at Toy Fair and trade shows." "We are always looking forward to seeing their newest ideas." "Genie Toys is consistently one of the top toy and game invention groups in the industry. A leader in the field of toy invention." sets them apart from many other inventor groups." "The toy industry needs more companies like Genie." "One of the most brilliant inventor groups in our industry." one of our longest inventor relationships on record." play and interactive nature of our products!" "Innovative, fast moving, trend savvy and a pleasure to work with."